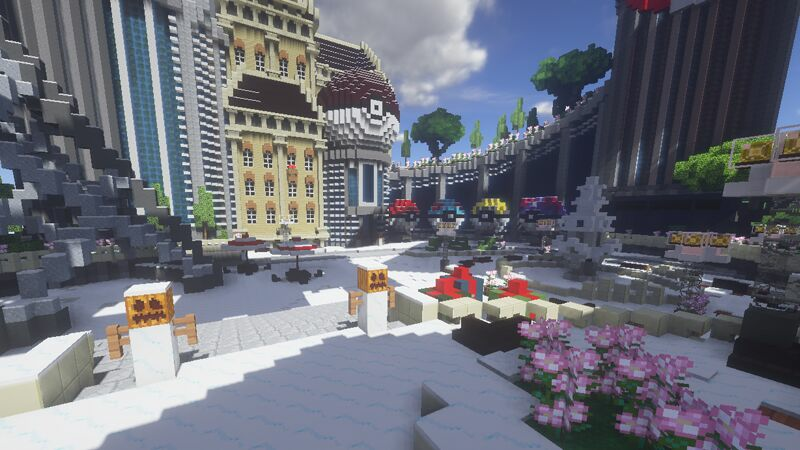 Currently Our Spawn is in Winter Mode! Tis the Season and a Happy New Year! Typically how spawn looks for our players. Inside the building with the Pokeball is where '/warp crates' is located. 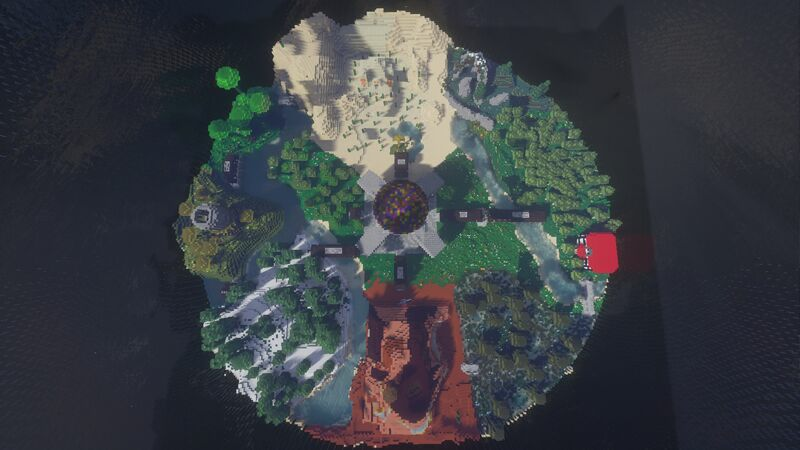 Here is where you can find lots of things such as healers, pcs, trade machines, enchantment table, and the entire spawn map is filled with chests for our custom mini-game: "Treasure Hunt"
This is a top down view of our Safari, get access to various biomes and pokemon here! We have Player Gym leaders for our gyms. Players who apply for Gym Leader status will receive their Gym Pokemon from us. 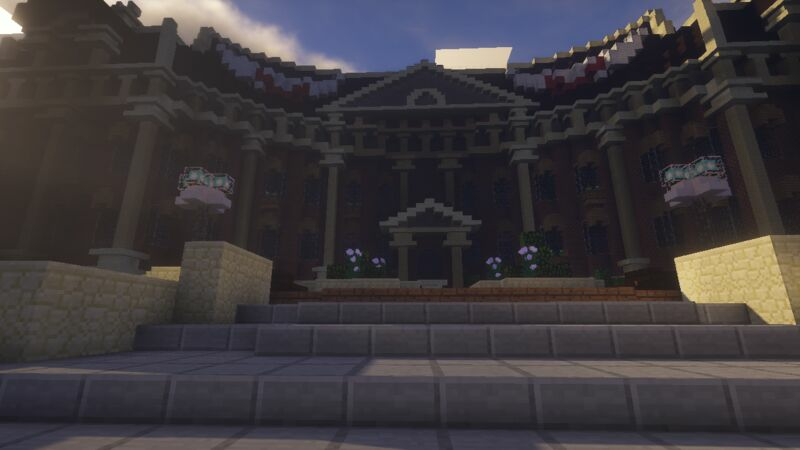 We are a Pixelmon server that will always be running version 3.5.1, and striving towards dedicated staff, quality gym leaders, and imaginative creations alike, we intend on trying to give you the best experience that you can from a Pixelmon server! We have currently been up for almost 2 years now and have had one amazing adventure as we have been up! Upon joining, we have shiny starters, a trainers manual, crates, monthly promotions, a warp system for server builds, and a player warp system for player made builds. Start your adventure right away by doing “/kit trainer” and then doing “/warp wild”, “/warp safari”, or “/RTP”. Along with having your own pixelmon adventure we added many things to keep you busy such as playtime rankups, crates, marriage, mcMMO, player vaults and more! We have wonderfully friendly staff and are always seeking Helpers. We have slowly been introducing new content to the server. Some of our proud introductions includes the ability to buy donator rank with in-game cash, mini event treasure hunt, mazes, and the player warp system. Seasonal events such as our current one: “Turkey Hunt”. And have a wonderful Discord Bot that will update players even if they aren't in game on the latest activities happening on the server! Our main focus on being the best we can at customer service and creating and engaging community. We have seen how other servers create a paid2win system and have been forcing players to upgrade their Pixelmon version. We will never update our server out of 3.5.1 as we believe players with bad hardware should have a chance to enjoy the wonderful world of Pixelmon! We will later have other pixelmon servers out, but currently are only focusing on this version. So if you hate paid2win servers and/or don’t have the best hardware in the world, you’ll love our server! Hi, I have been playing on this server for about a week now and I have had nothing but fun. The hole community is super nice. Myself I haven't played much pixlemon so I don't know what to do but the staff and community have helped so much. I just want to say that this is probably the best server in the world. Great server i love it because of all the people who play on the server!!! And its just awesome! This is one of the better servers on pixelmon for me as it includes many features I want like wondertrade, etc. But the voting system doesn't quite work. This is also good because it uses 1.7.0 pixelmon which is what i run and pixelmon has shutdown so this could end up one of the only servers left. Keep up the good work. I love the Server ist nice! I love this server since I haven't played in a while. This a great way for me and my friend to play again. This server is my favourite and can't wait to keep playing. I really enjoy the server and the people on it. its not to crowded and there are events like treasure hunting and dp. i would really recommend this server. its a great server and has a great starting kit. the starting process was easy and fast. TBH I really like this server its very balanced friendly and no one is taking up a large area its all broken down. It's great fun and I recommend it to anyone! This is a great server. EVERYONE is nice and tones down swearing. it is gun and helped me know things. we all get jokes like calling chickens rare pokemon, and are all agreed on many subjects. I love your server and I like how nice the staff are. I recommend this server a bunch. It has friendly players and staff and Rewards that will make you want to vote more often. But it would be better if the staff were on more often. I like the fact that it is a small community server and also that the server hardly lags. The one thing I dont like is that the server only lags when the server sends out large messages. This is a 10/5 server. I love it I play everyday with my friends. I recommend it. It may not be a big community but it is a helpful one. This server is a really good server. The staff and owner are very nice and the players are also very nice and helpful. This server is small and I like that, no spam chats or anything like that. Everyone on the server is very friendly as well, they make you fell welcome. I loved this server because my friends and I are hosting a pixelmon series on this server. Another reason why its so good is because it is an actuall challenge. You can't just buy wool and stuff from stores. Overall this server is amazing, and I would keep on playing it. I like the server because it has nice players and there isn't any spam on the server. The server has active staff, a great shop and warp system along with an interesting job system, overall it's a fantastic server and I'd highly recommend it! I really like the server it`s helpful and fun . I love pokemon so pixelmon is the best . I´m not just saying that Ilove the server it´s Amazing . I love this server. This server is so much fun and their is so much to do. I do lag and also when I mine blocks sometimes they come back and I have to mine them again but other than that this server is one of the best servers I have played. like how the staff is really nice and will help a new person like me. So far, great community, helpful staff with a sense of humor... big deal for me... having fun! This server is't terrible but it's not the greatest the staff seem interested in helping and it is kind of laggy. People on the server are welcoming. I enjoy playing on the server a lot. I would indefinitely tell others about this server. I really like this server.My favorite mod is pixelmon and this is server is letting me play it with my friends. I like it so MUCH and i highly recommend it to EVERYONE. the server is awesome and i love it. the people that are on it are fun. i'd definitely recommend this server to anyone. I really like the community on this server. I first joined yesterday, and off the bat a person came over to my "base" and offered me help and left me a chest with some items. They did this twice. What I dislike about the server however, is the that there are no gym leaders. Until someone applies and gets accepted i feel like some staff members could take place of being a gym leader just so players can fight the gyms. Also, the mazes 2-4 look done from the outside but are not released yet and I would really love to see them released because I enjoyed the first one quite a lot. /reviewserver This server is great and I would highly recommend it. It is super fun because of the cool things they add like the wonder trade , treasure hunt, and more, plus shiny starters. anyone who likes pokemon should try this out! This server is LIT my guy 69/69 would recommend. Really nice! Would recommend to anyone! This server is small but it feels like home since the second you join. When you join you always get welcomed and it feels like it is one big family. This server is amazing and I will not be leaving it ever. I have not been playing for long but this server seems to have a lot of potential to grow behind a well set up server and kind and helpful staff. I've been playing for a bit and the staff and people on this server make it such a fun experience and make it exciting to play. This is something I'd play everyday. Great job! This is a very good server that cares about players having a good time. It has claims so you wont get griefed. All starter pokemon are a shiny as well. Staff is always there to help you wich is awesome. 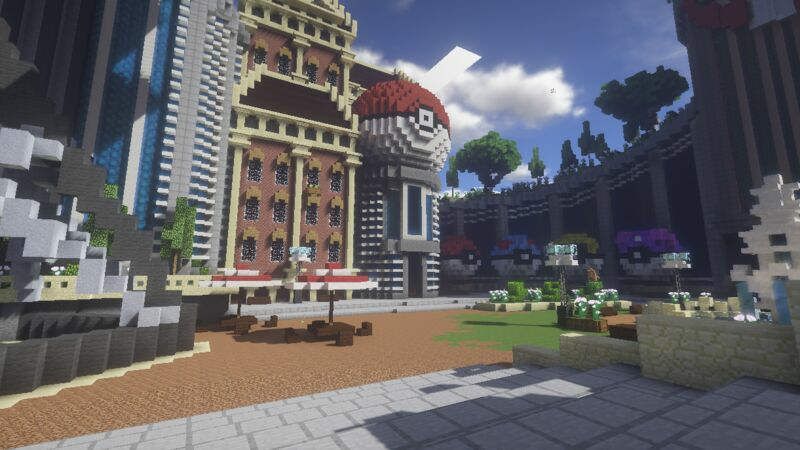 I have great fun playing on the server and everybody hwo loves pokemons and to have great fun should play on this server. I love this server and its ranks. not pricey or cheap, great server! This server is awesome! The players are nice and the staff team is helpful. The only thing I dislike is that I can't buy stones (Dusk stone, Sun stone, ect.) in the shop. This is honestly the best pixelmon server i've played on. All overs either dont work on my pc, or dont work atall. At first i was scepticle because it's only 1.7.10, but i later found out, that doesnt matter. -Why dont we have access to /playtime ? I find this server very fun and i recomend it to any experienced pixelmon players because it has great staff & community, shiny starters, and much more! I really like this server! There are many rewards, but not too much to make the gameplay overpowered. The drop parties are great, and I hope to play on this server for times to come. i like the server very well. He's my first pixelmon server but i heard of friends it was a good server and i like it. The staff is very helpfull and friendly. I like the shiny starters and the dp everyday. This server has a very welcoming, helpful and friendly community. I am glad to be a part of it. I was at first a bit confused about how everything worked, but the server has guides and very good informative people that helped with any questions I had. This server is one of the most friendly servers ive been on, not just the staff but players alike are kind and caring and i would highly recommend that you join this server too. if i could change one thing it would be that you can randomly teleport to different locations instead of the one spot when i do "warp wild" but people are that nice you can get any where just by talking. This server peaked my interests that no other server could, a kind caring community, I look forward to staying. I love this server!!!! In my own opinion I think this is the best pixelmon server!!! P.S i recommend this to people who are new to pixelmon. I enjoy this server a lot, it's nice, no lag, active, and friendly mods :) Some of the people on the server aren't that nice.. But it doesn't change how much I play on the server. It's a lot of fun, it has allowed me to be able to enjoy a modded Minecraft with a loved one. This server and mod has brought me so much nostalgia and I can't get enough of it. Especially with the lottery regarding the crates and such, those add some spice into the server. Keep it up! I joined the server 3 days ago and its awesome.All staff are very friendly and they help you immediately .The only negative to this server is that there are some time lag and you can't play but after all its a good server. There are 2 things i like about this server and the are no bad things I'm going to talk about. the first thing that i like about the server is that there are crates so its like a game of chance to see what you get. The second thing is i like the drop party and treasurehunts that we can do and how we can rome free around the world and make our own bases. I'm really enjoying this server. It's fun and has a small community that i like. I really enjoy the minecraft server because it provides a friendly place to play along with a good way to play pokemon. Also it is great that it is filled with plenty of activities. I really like the SilverMoon server!! The community is so nice and everyone is respectful to each other! Also, the server doesnt lag to much and there is a lot to do!! I love this server! People are nice but a little cringey lol. Its pretty ez to get mons and there is always a good amount of staff on! I just started playing 3 days ago with some friends and we all love it. It is for sure the best pixelmon server I've been on! I really love this server after just a day on it. Everyone is so friendly, and are very helpful. The only thing I would recommend is /pokesell because I find it hard to transfer pokemon. Other than that, I love this server, I would definitely recommend it to anyone that plays pixelmon. This has been my favourite pixelmon server so far. The users are friendly, The owner and helpers are helpful, and there are events and fun things. Would recommend to people looking for a small server to just play to have fun. I think this server is really really great and I am going to try to get some friends to play on this too. I like how there are shiny starters and a nice community. My english is very bad ,but this server i'm newbie and all guys helping me,nice staff, and very nice things to do people are so nice,no one is retard there i like it so much ! Id like to share my experience on silvermoon. As I joined i got welcomed which is Always nice and makes you feel at home. The server runs very smoothly and has got a good looking spawn/warps with plenty of healing/pc's to use. eventho the playerbase isnt very big, the people which play on the server are nice which is great. overall my rating of the server is 8/10 so far. I like this server It's great player are fun and nice.I would recommend this server to anyone. This server is amazing bringing pixelmon fans together! The pixelmon is seach a great server. The community is amazing, and they are fun and extremely kind. Everyone is so helpful. I was new to pixelmon when I joined the server, and everyone did a great job helping me out. I enjoyed this server so much, and I know I won't be bored of it any time soon. I love this server! it has a friendly community that will help with anything. The owner is also on from time to time which is uncommon for a lot of servers! i would recommend this server to all pixelmon lovers! This server has great people, but has some laggy problem times, otherwise, probably my most favorite server. This is the best pixelmon server I have ever played on and I have played on atleast 10! Also the Admin DaveyDino is the most helpful Admin/person I have ever met he helps me with everything! Overall, this server is amazing and deserves a lot of credit for the things they do for people. its very quiet. which can be a good thing for loners or those who just want to have a fun time with friends without interferance from other players. This server is very friendly and good for beginners and veterans alike! The staff is remarkable, and although the server is relatively quiet, it's in a peaceful and enjoyable way. There are so many ways to get involved in the community and work your way up the ranks, and I'm really glad I found this server! I LOVE THIS PIXELMON SERVER!!! Since I have joined this server It has been really fun. It began with the staff being a great help and not even the staff was a support but the players as well. After not having played Pixelmon for years they helped me get through with It in no time. They have nice features as well like not being a pay-to-win server because you can buy a IN-Game donor rank with in-game money and that Is one of the best parts. They have a quite nice safari zone where you can just about find any pokémon you need and can train up with. Even though I just started playing I already spent a nice amount of time playing on It. So I want to thank them by giving them a review on their server. I love this server because everyone is so kind and helpful and I like all the server builds like the safari zone and spawn. I would recommend this server to anyone who plays pixelmon. I really enjoy the community and players on this server. The server owner is on quite a bit which is awesome. Not much people play so that means usually no spamming! I would highly recommend this server to anyone. /reviewserver i would tell everyone to play this server for how helpful and fun everyone on there is! The thing I like about this server, would be the vote crates and gyms, I like the vote crates because you could get quite lucky and get a good amount of money or another key. And I like the gyms because of how challenging they can get as you go through them. The one thing I would suggest to add to the server, is a shop of some sort, since I can't seem to find one with the warps or add it to the public warps, if there is one. I've already made many valuable friendship/acquaintances on the Silver Moon Server and I enjoy playing there despite that I'm the one making Pokeballs for my IRL Friends who don't know much about the pixelmon mod. I enjoy the hunts every once in a while, and I kinda wish there were more opportunities for people who can't pay to gain access to EV Training. I think having a secondary Training Area just for Leveling up Pokemon would be a very smart idea for the server. While only having played for a small amount of time I find it fun and while the community may be small at the moment I hope the server will grow and advance just as other servers do. I have only been on the server for awhile but I am already enjoying it more than others I have played. The community is more involved and it isn't overpopulated. The shop has a great variety of items and the prices aren't outrageous. The staff are helpful, and the vote rewards and crate rewards are good. Only complaint is there not being a place to vieve /rankupgrade info, so maybe a warp, with signs telling you which rank you rank up to when you reach a certain hour, and how many hours you have. This is a very player friendly server; It has a very welcoming community, and different, unique ways to play. Silver moon is a very good server and i have enjoyed my time playing on it all of the people have been very kind and helpful, there is only one thing that I have found that i don't enjoy all that much and that is that there is no random teleport which is a very easy fix and could be changed very easily. i really like the server, it is well set up and the people are helpful, i would like a random teleport system set up though. This is a amazing server! Me and my fiancee (Nimaa) Absolutely love it! I like this server because of the nice staff the owner and how nice daveydino is to me and my friend Hamloid. This server automatically caught my attention and I love it very much. The only problem is the spawn rates are a bit too low and alot of land has been claimed. i really enjoy this server, the people are very nice and helpful, and there is almost always a member of staff active. I may of just started like 2 days ago but this server is prob the best i have ever joined I would recommend this server to anyone who loves to play Pixelmon. i think this server is very good and has a great community and also a very kind community and helpful if you need any help someone is there to help and i asked a mod about a gym and they then subed in immediately so that was amazing overall i think this server is a good sever and should stay a server for a very long time. It's a great Pixelmon server! Everyone has been helpful, kind, and very welcoming. The staff are generous, and are online often. /reviewserver I have not been on the server long but long enough to feel that the people here are kind. I feel like I can talk to the people knowing I won't get verbally attacked. I have played this server since early 2016, and I have really liked the community and the staff team. I will suggest this server to many people to play. The owners girlfriend stole my master balls and then used /control on me, I re-logged to try remove the control and she took the master balls and hid them in a public place. I asked for my master balls back and then they banned me perm from in game and the forums. This server obviously had a lot of work done to it and there was a lot of time and effort put into it. I really enjoyed this server playing on it with my friends so I would pass the ip on to anyone who asked me about a good pixelmon server. I've really enjoyed this server so far, the staff have been very helpful in answering my questions, and the community seems very welcoming. I like the fact that the pixelmon mod is on an earlier version as the newest one makes me lag to bad to play. I also enjoy that you get paid to do jobs for ex. mining. I think I would like more of a shop set up so I could buy things however. Hey this server is awsome i love this server its 1 of my favorite. The people on the server are very nice they have made my starting experience very enjoyable and i hope for many more hours played on this server. This is the only server that i can really like becuase it has no lag and no haters so i feel like i can make a bond between me and the players on this server my acount name is AmINoticedYet. I was new to the server when it was fairly new, and coming back to the server after having so much hard work I have seen how much it has grown. I wish that some of the older players still played, but everyone has to grow up. I do enjoy seeing my old friends and meeting new ones too. Thanks for an awesome server, Kyle. I really like this server. It is a lot of fun, and the staff is very helpful. its 1 of my favorite Server thats insane! I'm enjoying a little systems Server Jobs are very interesting, but, not being able to speak English with my friends, I think it's kind of Portuguese censored. im in and when i join i got ultraballs andcandys the admins is very happy and i happy there! This server has amazing staff and events to keep you interested and the people on the server are always kind. If you are buying a item from a player, they will never scam you. I LOVE the drop partys and the voting keys, but i would love to see somethings in the future like the pixelmon GTS, but besides that everything else is cool! (but u cant do warp wild). I have a bad computer that causes me to lag on almost every server, this one I run rather smoothly on however. I find it has a good crate system, the area they're in could be neater but eh.. I like the builds on the server too, being a builder myself on a server or two, I know how long big builds ca take, and how much effort yall seem to have put in; it looks great. As far as I can see it's a good server. I enjoy the sever a lot. they have a lot of events, but the staff isn't on that much which is my only con about the sever. Everything else it perfect. This server is actually very cool, I would recommend it to any friend that may play MC on PC. It is friendly and compact with awesomeness. It's pretty fun because you can play with your friends but I think that pokemon should spawn more often! 8/8 m8 :3 nice people,no problems,dank memes. love this server so much fun. /reviewserver I love it it doesn't have a lot of people so its very quiet. I love how quick the wondertrade works so thank you for this awesome server!! I personaly love it, even though there isnt a random teleport option ( which realy bugs me) i still like how simple it is compared to most other servers. Only problem I have is that most of the time im alone because of my time zone. This server is different, and fun with great people. It's unique compared to some of the other servers, the people are nice and It's a fun server. I think the server is excellent. Nice staff, friendly players, great rewards, and its a lot of fun to play. Overall, a good server! Great server recommended the admins are always helping with what ever you need should always play. other pixelmon servers normaly do. The server is great, it had me at the very first moment I joined. The owner is very nice and helpful which is a bonus. Recommend to everyone! I really enjoy the community and players on this server. The server owner is on quite a bit, and the server got the /back command! This server is very fun! So recommended. I am so happy that i found this server! Really good,owners are on frequently,and all round i would say 11/10 would recomend. Has a fun, nice, small community that is perfect for many people. Lag doesn't happen too often and i would recommend this to all! I have really enjoyed playing on this pixelmon server for the last day. I would like everyone to know about this server, because of the friendly staff and the great community. I would recommend anyone to play on this server and guarantee they have a great time! I like this server because it is a very active Pixelmon 1.7.10 server. Pingiun101 is always on and so is Daveydino. It is very easy to navigate and the treasure hunts are always fun. the server is awesome. The staff are really nice and cool. I LOOOOVE THIS SERVER! THIS SERVER IS SO MCH FUN I PLAY IT ALL THE TIME WITH MEH FRIEND LOGAN. There are so many generous people that giveaway shinies and legendaries all the time! it has nice staff and once i joined they welcomed me and touted me how to use the kits they were so nice! Great community full of friendly and helpful people, active and hardworking staff working to make our enjoyment better. Impressive builds and artwork along with friendly neighbors, nothing can beat it. You should come by it's worth it! Definitely the best pixelmon server <3. This server is really fun and I enjoy playing on this sever alot I hope more people come to play here. This is the best Minecraft server I have ever been on I would toatally recommend this to anyone. A thing I disliked about the server is the voting, this is because that I did not get, I also did not get the message in the chat saying anything about me voting yet the sites said I did. If this could possibly be fixed, I think more players would come online. I love this server I became gym leader and people are really helpful here they do dropparty and a lot of treasurehunt stuff and giving away ranks I highly recommand this server this is the best. Silver Moon Pixlemon server is amazing, I've played on many Pixlemon server's and this one is by far the best, the people on it are so helpful, the spawn is well built, there's active mods and the owner is on a lot. there welcoming, the wild isn't destroyed, there's always a good place to mine somewhere near you and there's fun quest, drop party's, a game called treasure hunt and wonder trade is only every 5 minutes. This server deserves nothing more then support and thanking so i would like to thank everyone on this server that's helped out or even joined. Thank you :). From Cyan Sheep. Server is the best pixelmon server I have seen! I have been on this server for 3 days and the people are active, and really nice. The staff are also Active, and nice, They set up really cool events that give you cool items and pokemon! In the end this server is really good! I just started out on this server and it's safe to say this is my go to server to play on for a very long time. The staff here are always friendly, they are very good at keeping the server community happy and making sure your happiness is their number one priority. Thank you for taking your time to read my review, come join the server! This is a nice friendly server and it runs smoothly with cool gifts. I think this server is great, has an amazing community, and has an outstanding staff. I would recommend this server to anyone who is looking for a server. I love this server!! i got so far into it.i will keep on recording on this server because its so awesome!!! i will tell everyone else about it!!!! The staff here are amazing and the atmosphere is always Jolly! I love the community and the Discord to server system, the community is great and theres always some one to help me if i have a problem! I love this server there's so many options, and fun events to do to keep you busy. Good community! Lots of neat features and warps to explore! Silvermoon is a great community with nice staff and owners. It deserves more players. The Server spawn is quite nicely built. the owner is very friendly and kind like a server owner should be, The Voting reward systems are balanced, and You get a shiny starter! Whats not to love. Im also a server owner and it should say alot that i enjoy this server more than my own. The owner is extremely active and experienced and all staff is very mature and helpful. The server is fun and has alot of stuff to keep you busy including alot of features not found on other servers. This server is my favorite server, make sure to come check it out!!! This server is awesome! I love the friendly staff and the friendly people. This was my first pixelmon server and I think its the best! I haven't been on that long but from what i have seen this server has a lot to offer on top of potential in spades. The community isn't too large but it's definitely welcoming. The staff hold a professional manner about things and for once the owner isn't out to steal your money with the donor shop. I spoke with him and he told me his reason for the server is to further his own developer skills and that any server funds will mostly go towards the better of the server. I love the fact that as soon as i joined i immediately felt like i had known these people for years. Never have i had such an amazing first experience with a server. It has a nice balance about it to where new people won't be under-powered for too long compared to the older players. heck with a little luck you could walk away with a shiny or legend with your first voting session. My friend netted 3 legends in our first hour simply for participating in what the server had to offer. Yet even with all of this it isn't TOO easy in my opinion so it's approachable from a casual or competitive standpoint. I am proud to give this server a 4.3/5 as they will do their best to make everyone's experience the best it can be. As the owner would say "We aren't perfect but we try our best." Thank you for considering joining the server and i'll see you in game. I really like the server because the owner is incredibly nice and generous. 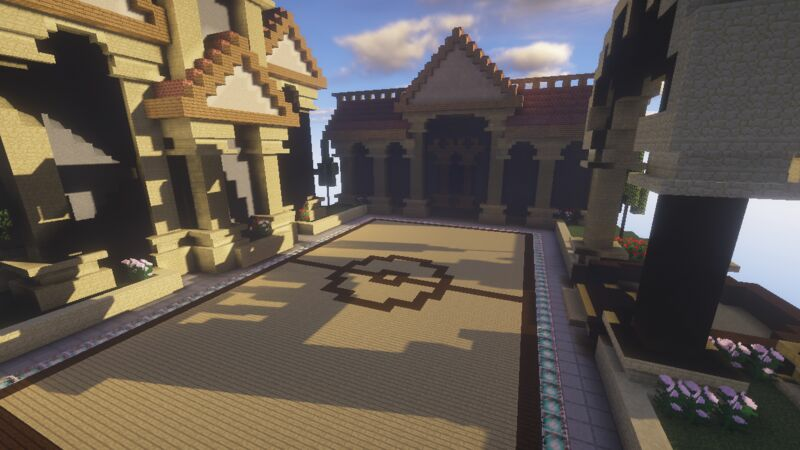 The spawn looked professionally built, the server is presented nicely and overall, the community on here is friendly and I really recommend being on the server. it's just a lot of fun. I like this server because it's a light, friendly community. There are a lot of commands I enjoy using, one of them being /back. The shiny starters are cool and the vote crates were something I've never seen before. Overall it's been a great experience on this server and I hope it continues to thrive. Very Fun and Fair server. The Owners/Admins are always doing things to made the server better and will always have time to provide assistance. I give this server a Choccobo/5. This is a great server! The staff is on quite a bit and everyone is friendly. DPs are hosted often and if you have a problem with something everyone pitches in to help! I very much suggest this server to anyone who is looking for a friendly pixelmon server! I love this server i wish legendaries would spawn a bit more often but other wise a great server mabey even add an ah. This is a good server and i like it. I love this server and so far have found no flaws. I am looking forward for the update. this is a fantastic pixelmon server, i reccomend! I can see me and my friends playing this for a long time! This server is very fun and cool. This is a fairly good server give it a shot you might be surprised. I enjoyed playing Silvermoon a lot. I like the community! This server is one of the best pixelmon servers I have ever played because of the plugins, types of eggs you can get, and how the staff care for the players. I recommend joining this server if you can. I really really really enjoy the server and all the staff and the owner ;) this was my first real server and I'm glad i found it! The server is a very big and nice server.It is very fun. 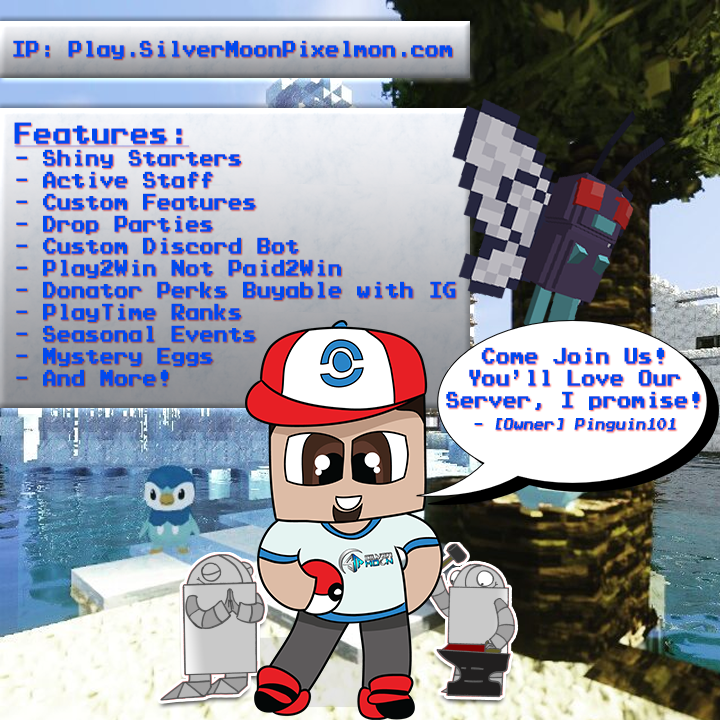 I Think that The server Silvermoon Pixelmon is one of the best pixelmon servers around since day 1 i have loved playing on it and spending time with the community of the server. Silvermoon is one of those servers that everyone basically knows everyone on the server which is really good for the entire well-being of community i think that is currently my favorite server. The server does need to work on some stuff like fixing some bugs but overall the server is going quite well for how small it is. I love how the Owner is constantly on the server and is interacting with people on the server. /reviewserver The best server I could ever ask for and the nicest server peeps ever keep up the good work. I like the concept that you have a survival world so you can go get resources,etc and build a house and claim it. The server has friendly and good staff they help you when you need help, most of the players on the server are also friendly and help you where they can. Its also nice that they added a feature that you can buy ranks with in game money for the players who cant afford or dont have permission to buy it with real money. Also they do mostly once a week or more drop partys thats also really fun. The only less good thing is that they need to add more items to the shop but I already heared that the owner is working on that. I love this server because everyone is nice on the server. I LOVE IT! after 2 days of doing this, i am absolutely entranced! When I first joined the server I was immediately greeted by 3 members of the staff and that really gave the server some charm. It is a fantastic server with friendly owners and a great community. This point is conveyed very well by the donation driven drop parties and the holiday events that I find keeps me coming back onto the server. I very much like this server and expect to continue playing for quite a while. Thank you so much for this review, I really appreciate it and hope to continue serving our players as best as I can. The server is great, the staffs are almost anytime online and are looking for gymleaders (i still want to choose own pokemons, but you get a team), i like the part of how many dropparties there are and how friendly the ppl are. I like the way they use events like wintergifts, treasurehunt ... .
and much more. there's friendly staff and friendlyplayers who will help you if they can. But there are much helpers i think 6 i see 1 online 8 gym leaders only 3 online (maybe make it NPC) . When i wrote this they're searching for sub gyms so if i was you i was joining right now ;). This server is very good because the player are very friendly and the events are very nice. This server is toxic they don't help at all when I got stuck in a hole and my game froze so I couldn't get out and no one helped. Plus their website isn't even usable. I've always been trying to find a pixelmon server just like this one! Where you get welcomed, It's not pay to win.. and everyone is really friendly; The owner is online quite a lot too.